One of my passions is running trail races, especially Ultra Marathons! It may be understood, but running 50 miles is no easy task, it requires a lot of dedication to a rigorous training schedule. Even though the actual race day is what I enjoy most, there are many days I struggle to get out the door for a run in the morning. So many times it’s very tempting to just hit snooze, or just flat out turn off the alarm. There are days I do speed workouts, which I have a love-hate relationships with. Most of the time I just hate them. There are days on the weekends that I run for hours, but would rather be at home with my family. Training to run 50, or 100 miles essentially means you have to run A LOT, and many times you have to run even if you don’t feel like it. Running a business based on your passion is very similar. You may have heard the saying, “do what you love and you will never have to work a day in your life”… well that is only a half-truth. Even when you are doing something you love, there will always be a “training” aspect to running the business. For example, I also have a passion for healthy eating, and fueling my runs and rock climbing adventures with healthy foods, as well as educating others about the benefits of a healthy lifestyle. Out of that spawned my company, Bearded Brothers. We make delicious organic energy bars, which is not easy to do. We started our business from the ground up; we did the sales calls, we made the bars, we shipped orders, we swept and mopped the floors. There isn’t a single aspect of the business we were not involved in, and there still isn’t. I often still take out my own trash. But all of that served a bigger purpose – helping others to fuel their adventures with healthy organic foods. Running a business based on your passion isn’t all sunshine and rainbows. It’s going to take a lot of hard word and dedication. Many of the things you will do to serve your ultimate purpose will not be that enjoyable, but knowing that your passion is ultimately what drives you will make those less enjoyable but necessary tasks much easier. Since starting Bearded Brothers four years ago there hasn’t been a single day that I have not been excited about going to work. I think one thing to remember when starting a business based on your passion is that anything worth doing is going to be hard. Nothing in life worth doing is every easy. So get out there and hustle after your dream – it will be worth every sacrifice you make! Posted in Business, Motivation and tagged dedication, marathon, passion, running, training, work. Bookmark the permalink. I’m a huge believer that hard work pays off, but at the same time I also recognize providence plays a part of every successful business. Every connection made, every contract signed, is all a combination of hard work, discipline, and a good dose of divine providence. This has been hard for me to ignore with the growth of Bearded Brothers. A recent example of this involves our growth, and lack of it, with Whole Foods. We are currently selling very well in the Southwest Region of the store chain, but despite our strong sales, great branding, and incredibly great tasting product, several others Whole Foods stores in other regions recently passed on carrying our brand (most of them without even letting us know why). My first reaction was, WHY? What is going on? The Bearded Brothers brand is so strong here in Texas, it’s growing in other regions as well. Our product tastes amazing, and people love it. Why in the world would they not want to sell our energy bars, especially with strong sales in all our existing locations? The answer…PROVIDENCE! Thank goodness for that, because not getting into other Whole Foods regions at the time ended up being a huge blessing. Just a couple months ago we attending Expo West, the largest trade show for natural products in the country. After that show our growth rate went through the roof, and we are working with another large retailer right now that will launch our product in July. Our hard work was still paying off, despite not getting into other Whole Foods locations, which was part of our original growth strategy. It was a blessing because it opened up doors to work with another major retailer, and it allowed us to meet the growing demand of several other new customers. If we had brought on other Whole Foods regions when we had hoped, we would have REALLY been struggling to keep up with the demand. I have seen countless examples like this as my business has grown. Hard work and dedication really does pay off. But when things don’t happen the way I was really hoping for, I can ALWAYS find a reason to be thankful. Timing is another example of divine providence. There have been countless times things have come down to the wire. Since being in business we have moved three times, and all three moves came down to the wire. I find a lot of comfort in knowing that I’m not in control of it all. I can’t control every outcome, and that actually brings me peace, because at the end of the day I know that ultimately everything will work out for the good: even if that means my business tanks. Posted in Business, Motivation and tagged discipline, divine, providence, work. Bookmark the permalink. 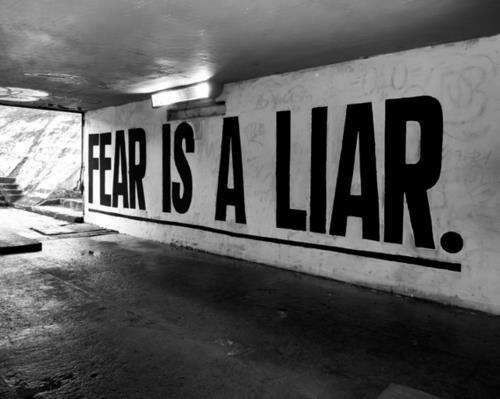 Fear is a loud annoying liar. It screams at you, “YOU CAN”T DO THAT.” But, you know what? That is a bold faced lie. I heard those voices for eight years before I broke the bonds of fear and started my own business. Fear spoke to me in a variety of ways. It told me going freelance wasn’t, “secure” enough, it said you will never make enough money on your own, it told me you better stay at your Government desk job with matching retirement and good health insurance. I heard all sorts of lies that kept me from going out on my own. Everything that held me back was just some form of fear keeping his thumb on me so I would stay right where I was, complacent and paralyzed. It took quite a bit of motivation to get me to see that having a “dream” job really was possible. Enjoying one’s work isn’t just some sort of pipe dream, unless of course your dream is to become a plumber. It’s possible for anybody to enjoy the work they do for a living. There was a time that I dreaded Monday’s. I rejoiced when hump day hit, and let out a cry of joy on Friday because the workweek was almost done. But, now things have shifted. My work never truly ends, and I long for the start of the workweek so I can get back to performing meaningful work that I love. Starting a business might not be for everybody, though. Before I started my own business I was working hard, sending out resumes to companies I would love to work for and could get behind their mission. There were plenty of jobs out there that would allow me to utilize my talents and skills to better the world in some way. The same is true for anybody out there. Finding those jobs just takes patience, persistence, and a lot of hustle. Simply firing off you’re resume in an email won’t even land you an interview. The point being, fear speaks loudly to us when we are trying to do something amazing. We have to silence that fear though, and refuse to believe the lies spoken to us. Anything worth doing requires risk, and will be a little bit scary. If it doesn’t scare you a bit, it’s probably not worth pursuing. Posted in Motivation and tagged business, fear, lie, security, work. Bookmark the permalink. So, I thought I would start something new this week. We live in a culture that dreads Monday, lives to get to Friday, and rejoices when Wednesday is here because it’s a sign we are half way through the work week. It’s a sad truth, but something I hope to change. There is no reason we can’t all be doing work we love. So every Wednesday I will post something motivational: a blog post, video, photo, or podcast. The point of this weekly post will be to spread encouragement, as well as to give myself weekly reminders of how awesome life is, and how blessed we are that we are able to work, and have work that is fulfilling and enjoyable. Posted in Motivation, Uncategorized and tagged happiness, motivation, positive, thinking, work. Bookmark the permalink.